Chinchillas are strictly indoor animals so you will need to plan which area in your home will be his space and prepare a nice, fun-filled, safe cage for him. Chinchillas are very social animals so where you put his cage will be an important decision, especially if you have only one chin. Don't think that just because chins are nocturnal that they must be kept away from everyone in a quiet room all day. You want an area that you spend time in, but is not too hectic. If you set up a really nice cage for him with a house that he can have quiet time in, then he should do fine. He will sleep all day, while occasionally getting up to munch on hay/pellets and maybe to say hi to you. When evening comes around he will be happy to have company to socialize with and spoil him rotten with love. Please read our Emotional Health page also. Let's discuss the items you will need to get ready for your new chinchilla companion. You want to make your chin's cage as comfortable and fun for him as possible. There are many things sold for chinchillas, but please keep one thing in mind, just because it is in a pet store or has a picture of a chinchilla on the package, it does not mean it is safe or healthy for your chinchilla. I cannot emphasize this enough to you. We see so much junk food, unsafe cages, dangerous toys and other items not fit for a chin, it is shameful. I hope to help you sift through all the confusion and make you knowledgeable of the products that are truly safe, fun and healthy for your chinchilla. As much as I would like to encourage you to get all the goodies listed below for your chinchilla, I know startup budgets may not allow everything to be purchased right up front. An exercise wheel and extra wooden shelves are great for chinchillas and definitely things you should strive to get for your chin. However, I feel the most important things to invest in as a solid base for your chin's life is a safe cage, a high quality diet along with the basic essentials. You can always add more bells and whistles to the cage at any time. Here are the essential items you will need for your chinchilla: cage, wooden house, water bottle, food bowl, hay container, treat bowl, wooden ledges, dusting bowl, bathing dust, bedding/litter, chew toys. Pellets & hay of course which are discussed under Diet. Secondary Items: fleece hammock, exercise wheel, ceramic or marble tile, wooden shelves, cardboard tubes, urine guards. Let's take each of these items separately. 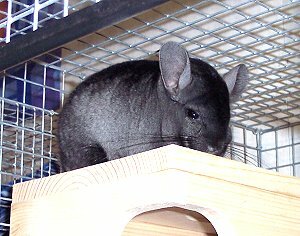 Please visit Our Store page for many chinchilla-safe products.